See the Adelaide Map South Australia Todays Weather. The city was designed from the very beginning, with wide streets and numerous town squares, parks and wide open spaces. These streets are now lined with cafés, restaurants and trendy places to shop. Unlike its eastern Australian city counterparts, convicts did not colonise Adelaide. Adelaide was first settled by Europeans in 1826, most of whom were British but also German, Polish, Afghan, Chinese, Italian, Lebanese, Spanish and Scandinavians. The city has preserved many of its original stone houses made by the original settlers as well as the more grand historic public buildings built during the Gold Rush years. Although there are many shopping centres around Adelaide and plenty of places to shop, in the city centre you would do well to start at Rundle Mall with its many arcades, department stores and speciality shops, including fashion, accessories and jewellery. 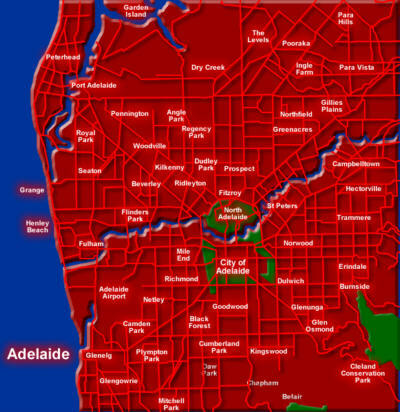 The large green belt surrounding the centre of the city marks Adelaide as a unique city. Called the Parklands, it gives residents and visitors a place to rest and picnic within easy reach and access. One can see, this is slowly being encroached upon over the years with public venues. Luckily, there is still ample space for relaxed walks, jogs and exploration. 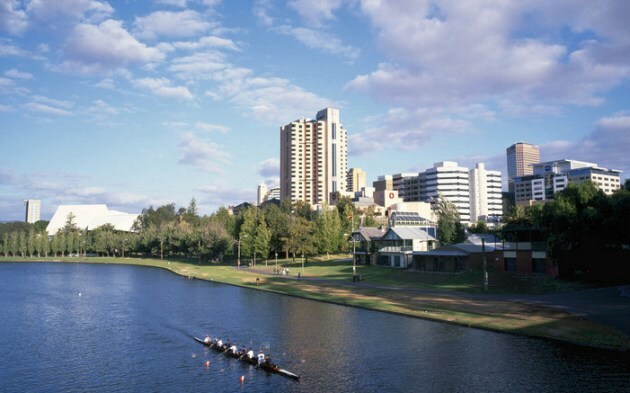 In the heart of the city and out into the suburbs, flows River Torrens that stretches for miles. Sealed cycling paths and hiking trails follow its course through gardens, parks, and natural bush. Adelaide Botanic Garden, Mount Lofty Summit, Hallett Cove Conservation Park, Cleland Wildlife Park and Belair National Park are among the many outstanding outdoor venues. See SA Map - South Australia Attractions - South Australia Museums. Adelaide has long been a centre for producing creative artists, not only in music, but the visual arts in its art galleries, museums, theatres and many festivals including the Adelaide Festival of Arts, the Fringe Festival and WOMADelaide. Further afield, take a wine tour of Barossa Region, Adelaide Hills or Clare Valley, or spend a few days in the Flinders Ranges National Park. The beautiful Adelaide Hills has historic townships to visit. There are many other tours, such as watching the Penguin Parade on Kangaroo Island that can be a real joy. In Adelaide there are Attractions & Tours to try, creative things to do, driving experiences, adventure and extreme experiences, family things to do, flying, getaways, activities for your group, outdoors, pampering experiences, water activities, wine & dine. Children and their families can enjoy a range of activities here as well: see Kids Fun. More about the many places to visit in the city centre of Adelaide: Places to Visit in the City. There are plenty of things to explore within easy reach of Adelaide as well. In the southern part of the Mount Lofty Ranges, there are the pretty Adelaide Hills, Kangaroo Island and the Fleurieu Peninsula. Numerous hotels from the best chains are represented in Adelaide, as well as the chance to stay in luxurious heritage accommodation. As well, other options include motels, youth and backpacker hostels, caravan parks and bed and breakfast places to stay to suit any budget. South Australia produces most of Australia’s wine and Adelaide’s proximity to the Indian Ocean ensures the freshest of seafoods as well as its own fresh produce. Italian settlers to Australia now make up the city’s largest non-Anglo cultural group, adding their distinctive styles of food preparation in the wide choices of fine cuisine available in the Adelaide area. Why not try a working holiday in South Australia? Work in Australia - Jobs.